No, not the drugs forum, the real one. I just read a book about it, Silk Road: A new history, by Valerie Hansen. The main traders during antiquity were the Chinese, Persians, Greeks, Syrians, Romans, Armenians, Indians, and Bactrians, and from the 5th to the 8th century the Sogdians. During the coming of age of Islam, Arab traders became prominent. The major edit: strike the focus on “trade”. Thanks to the dry conditions in the Taklamakan desert, we have extensive written records from certain cities and periods, and trade was– if you’re picturing huge, constant caravans– underwhelming. The size of a party was generally under 10 persons. Only a third of the parties had horses. Groups arrived and departed less than once a week. (We have these records because trade was taxed and regulated. To move within China you had to have a document listing the people and animals in your group and the cities you intended to visit.) It was also incredibly slow: if you made 20 miles a day you were doing pretty well. The biggest actor in the height of the Silk Road (the first millennium CE) was the Chinese government. It was the major source of product (silk bundles used both as cloth and as currency), of coins, and of demand (what it mostly wanted was horses). When the Tang lost control of the Taklamakan, trade declined greatly. Also strike “Romans”. The silk route was essentially a line of contact between China and Persia, with an important spur down to India. Quite a few Persian coins have been found in China; no Roman ones. (By contrast Roman coins are easily found in India.) However, the Byzantines got in on the action. The Romans had silk, but most of it came from India or the island of Cos.
And don’t picture people traipsing from Antioch to Xīān. Most trade was local– a merchant would make a circuit of 500 miles or so. Once you accept the scale and nature of the trade, I’m afraid Hansen ends up undermining her own point. She emphasizes over and over that “merchants” are rarely mentioned in official documents, that full-time traders were small beans, that pilgrims, Chinese garrisons, and official envoys were more important economic factors. Well, yes, that means that goods were traded. The people doing the trading might not have called themselves traders, but large amounts of materials were entering and leaving the region. Plus, don’t underestimate local-scale trade. There are Shāng dynasty tombs from about -1000 containing Central Asian jade. This was long before there was any military presence in the Taklamakan; but jade was increasingly valuable the farther you got from its origins, so it could migrate east in small steps. The major long-distance trade items on the silk road were things like spices, silk, paper, jade, and sal ammoniac– items that were lucrative even in small volume. 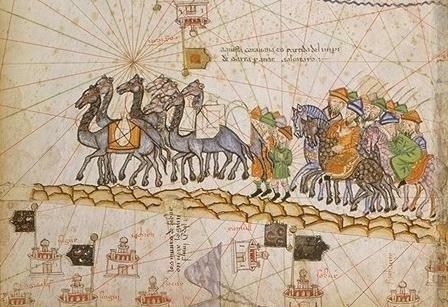 Thanks to the magic of geographic pricing, the silk road could move items a long way without any individual travelling its whole extent. Finally, the total tonnage transported might have been low, and mostly inessential luxury goods, but, well, what else would you expect? Large-scale trade in staples like grain existed, but within empires (Egypt to Rome, south to north China). Luxuries are big motivators– the European rush to reach the East was driven by a taste for spices and other Asian goods.